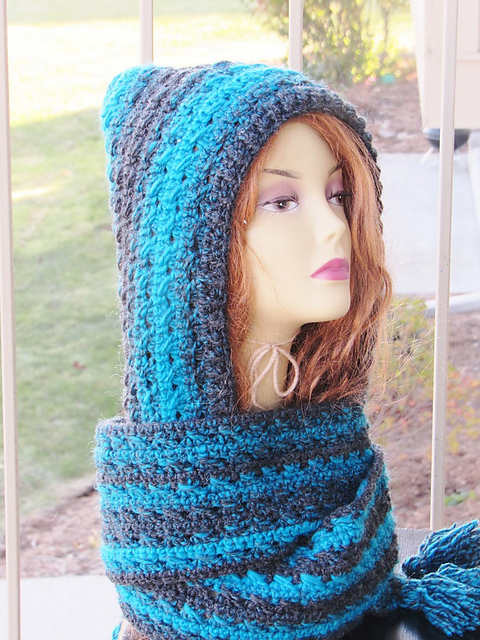 Stay warm this winter with this comfy hooded scarf. 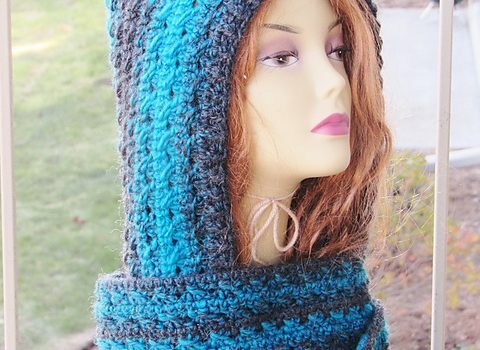 Heidi Hooded Scarf by CrochetDreamz is very cozy on a cold day and looks great so you can go about town in comfortable style. 1.Worsted weight yarn.The scarf pictured was made using Lion Brand Scarfie in color Charcoal/Aqua and was closer to worsted weight in thickness even though it is labeled a Bulky weight. One size fits all women. Hood is 12 inches high and 9 1/4 inches wide when laid flat. The scarf is 70 inches long and 5 inches wide. You can easily increase the length of the scarf by adding more chains or increase the width of the scarf by repeating the rows in sequence.